Food Allergy Training Is Slowly Being Mandated Across The U.S. - Savvy Food Safety, Inc.
Food Allergy Training Is Slowly Being Mandated Across The U.S.
Home > Food Allergies > Food Allergy Training Is Slowly Being Mandated Across The U.S.
As I’m sure most of you know, we have seen an increase in food allergies in the United States over the past two decades. The science and theories about why that is happening is a topic for another day. However, the rise in food allergies has had a major impact on restaurants and food service establishments. As we see an increase in food allergies, we need to see an increase in food allergy training. This is happening, slowly, in food service across the country. Over the past few years, more allergy training courses and certifications have been developed, and regulations for training and notifications have been put into place. But more needs to be done to educate and train food service employees around safely and successfully accommodating food allergies. Let’s review some basic food allergy statistics. Approximately 15 million people in the United States have food allergies, including 9 million adults and 6 million children. The 8 most common allergies – including milk, eggs, soy, wheat, fish, shellfish, peanuts, and tree nuts – make up 90% of American’s food allergies. Keep in mind, though, there are many other foods that people may be allergic to. In fact, there are over 160 foods that have been identified as an allergen, including some spices. The CDC has found that between 1997 – 2007 there was an 18% increase in allergy rates in children. Symptoms of an allergic reaction can include itching, swelling, stomach cramps, vomiting, dizziness, and even death. It is important that food employees get proper training to protect their customers from illness and, potentially, death. Along with concerns about proper procedures for food allergens, we must also protect customers with food intolerances and sensitivities and those with Celiac Disease. Food service employees need to understand the risks associated with food allergies and ways they can prevent allergic reactions from happening to their customers. Proper training is required to learn about the allergens, how to avoid cross-contact, the importance of labeling, and how to engage in open communication with the customers. With all the things that are happening in a kitchen, food allergy concerns can take a back seat. When front-of-house and back-of-house employees work together, customers can be served safely and it could very well save their lives. Congress passed the Food Allergen Labeling and Consumer Protection Act (FALCP) in 2004 which applies to labeling foods regulated by the FDA. But labels can only do so much to protect customers that are being served in restaurants and other food service establishments. That is why more ongoing training is necessary for all food service employees. 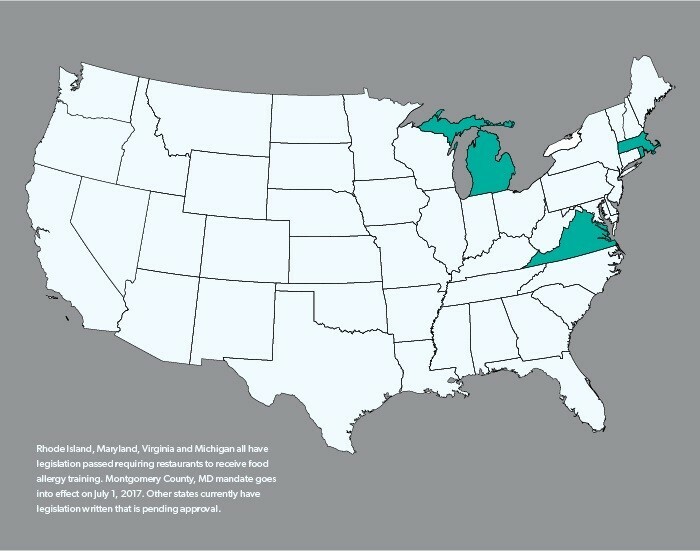 As of right now, there are five states, and a few counties and cities, across the country that have some type of mandated allergen training for food service. Just as it took for time for food safety manager certification to become standard across the country, so will mandated food allergen training. Massachusetts led the way with passing the Act Relative to Food Allergy Awareness in Restaurants (FAAA) in January 2009. Along with having certified food protection managers take additional allergen training, the law also required allergen awareness posters to be displayed in staff areas and notices on menus for consumers. Rhode Island followed suit, passing a similar law in 2012. Michigan’s regulations came in 2014, requiring the poster and manager training to address food allergies. In 2015, Virginia added allergen training standards to their regulations along with providing food allergy education materials to foodservice employees. Maryland started requiring food allergy awareness posters to be displayed in staff areas in 2016. New York City, NY and St. Paul, MN are two cities that have their own similar allergen awareness requirements. There are more states and jurisdictions that are trying to get regulations passed that will require additional training or some type of customer notification about food allergies. Although we have seen an increase in food allergy rates, the actual number of people with severe food allergies still remain a small minority of customers (about 4% of the adult population). I believe this is the main reason we haven’t seen more states adopt these new laws to protect those customers. It will take much more time for allergen training and customer notifications to be regulated across the country. Until the laws meet the protection of consumers, we have to take it upon ourselves to protect our food-allergic guests. Continue to train employees on food allergens, make them aware of the risks of cross-contact, and have discussions with customers to explain how dishes are prepared and any potential allergens in the facility. Having regulations for awareness posters displayed and a certified food protection manager knowledgeable about – and trained around – accommodating food allergies is a step in the right direction, however, restaurants need to continue to work to improve the quality of services for their food allergic customers. By all of us working together, regulators, industry, and consumers, we will be able to make the necessary changes to protect anyone with a food allergy. Susan Algeo is the Director of Project Management at Food Safety Training Solutions, Inc., where she facilitates food safety training classes, including ServSafe® and NRFSP®, for numerous corporations nationwide. She’s known for making the lessons – and the subject matter – memorable and engaging. An integral part of the Food Safety Training Solutions team, Susan also provides other food safety services, including consulting and more. As a consultant, she helps operators and their teams improve their standards, procedures, and overall commitment to food safety. Additionally, she conducts third-party inspections of customers’ operations to improve their health inspection results.